It is not without hypocrisy that I point you towards Glum Councillors – a collection of hard-working councillors working hard at pointing out potholes. I confess I was impressed by the care taken by some in donning high-visibility clothing before venturing onto the road. 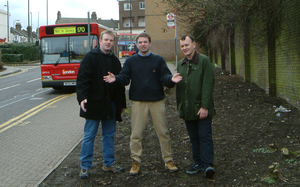 The ‘councillors points at pothole’ is a classic, and seems to be something of a Lib Dem favourite. Some cynically suggest they even get lists of work programmes from their local councils to take photos just before they are repaired. But however it’s done, you can’t deny it presents a, um, memorable image. We’d managed to get a fairly grubby patch of land on Falcon Lane (the road that runs between Lavender Hill and Falcon Road past Asda) cleaned up. And what better way to celebrate this than have three men stand on the now clear patch of mud. In front of an ‘Out of Service’ bus. Oh, and what’s the in the background. That ad on the side of the bus passing on Lavender Hill. Yes, a man in a nappy, that will really sum up the joy we feel about the cleanup.